I blame soccer for the latest trend in hockey. Soccer — futbol for the purists — is famous for the diving in attempts to draw fouls which in many games outnumber the fouls themselves. Hockey is developing a similar culture. Part of it is the European influence. With more players who grew up watching soccer’s divas playing in the NHL, they were bound to bring diving with them. Part of it is the league’s rejection of fist fights. It used to be diving was a corporal offense. Players adjudged to have dived were fair game for a beating at some point in the near future. And it was a shaming offense. Even bush leaguers hated being called a diver. In the Biddeford (Maine) over-40 league, I was the starting goalie for our team and played forward in just one game, when I forgot my contacts and so had to skate out. We were winning handily in the third period when the league’s yappiest little banty rooster shoved the puck past me at center ice and somehow wound up prone after falling gymnastically over my stick blade. I served the two for “tripping,” we won the game and then afterward in the bar we bumped into each other again. I congratulated him on his dive; he tried to deny it; I laughed at him and noted that he seemed to have better balance when he had a scoring chance in the slot. He visibly deflated; his teammates sort of edged away from him: Diving starts with the scarlet D, even in that league. It’s not how the game should be played. And I know about the code from the other side as well. Hockey goals are made of hollow metal pipes, with six-inch steel pegs running up the pipe from a flattish spike on the bottom that sticks into the ice, holding the net in place unless there’s sufficient force to shift the pegs. As soon as the net — which typically weighs between 80 and 120 pounds — is moved off the goal line — even by an inch — it’s a stoppage of play. One game in the over-40 league I was in net on a breakaway when the attacker and my defenceman lost their balance as they raced toward the net, and both slid into me while I was on my knees, driving me backwards, face-first onto the ice and crotch-first into the goalpost. I felt the net lift several inches off its post before falling back, so felt it was OK to take a short breather — once I could breathe again — to collect myself before I got up. The whistle went, and the ref came racing up to make sure I was alright. It turned out the net had fallen straight back onto its posts and he stopped play not because it was off its moorings but because he thought I was injured — which I wasn’t — as opposed to hurting, which I certainly was. 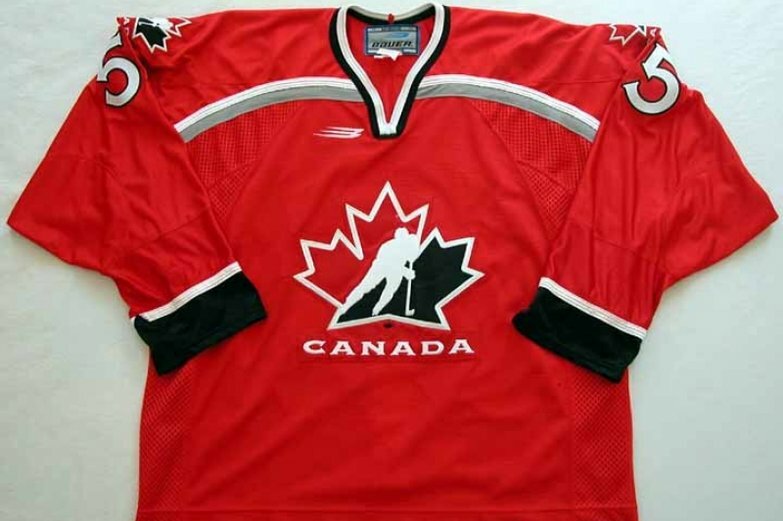 I happened to be wearing a Canadian Olympic sweater that night, and the ref — who it turned out was also Canadian — assured me he would call a penalty on anybody dishonoring that shirt by faking an injury. I apologized for having only moved the 100-pound net half a foot vertically with my nuts and not horizontally as I thought; he dropped the puck and off we went. That’s hockey. More and more I hear play-by-play announcers who have obviously never played the game dismiss as embellishment when a player’s head snaps back after they get hit in the face with a stick. I’m here to tell you it’s a natural reaction. Watch a batter’s head whip back when a baseball gets within a foot and a half, let alone when one hits him. Sticks are aluminum / wood / carbon-fiber blends. They’re cold, hard and compared to the human face, inflexible. They’re also often moving really quickly, and they hurt when they hit. They hurt when they hit your mask; they hurt a lot more when they miss the mask and catch flesh and bone. My usual reaction after getting a stick (or skate) in the face was to check my teeth with my tongue to make sure none were missing, waggle my jaw to make sure it worked, then use a fingertip to check for bleeding. And yes, I often flinched when I got hit. My head may have snapped back. It doesn’t mean I was embellishing; it’s natural when something smashes you in the face or comes whipping toward your eyes to move your head out of the way. So the next time a TV announcer criticizes a player for snapping his head out of the way of a flying stick, find a picture of the guy. If he doesn’t have scars, he doesn’t know what he’s talking about. And I’ve checked — none of them have scars. Next Post Gene Carr’s hair? Gene Carr’s hair!